Founded in 1951 by Mrs. Mildred S. Jones, Mildred’s Flowers has been one of Cadiz’s gems to the downtown for more than half a century! Mildred, widely known to the community as a wonderful lady that loved beautiful things and pretty flowers, decided to sell her business and pass it onto the next generation of small town entrepreneur. Ralph Calhoun had been the floral designer for many years. He and his wife Wanda bought Mildred’s in December 1978. They continue to own and operate the thriving shop, providing customers a selection in both fresh and silk flowers. A wide selection of gifts for all occasions occupies their store; plants, framed prints, pictures, music boxes, Thomas Kinkade throws and much more. For telephone orders call 270 522-3322. 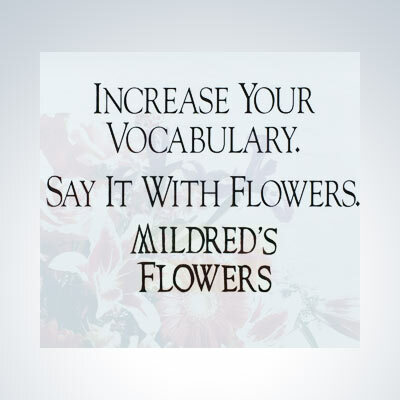 Or, shop on line at http://www.Mildred’sFlowersofCadiz.com.